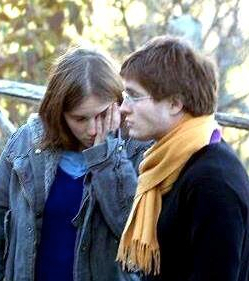 There is little doubt that this photograph of Amanda Knox and Raffaele Sollecito – in full lip lock outside her cottage in Perugia, Italy, while police inside investigate the murder of her flat mate Meredith Kercher – helped seal their image in the collective public mind. The photo quickly went viral, and supported the prosecution and media’s contention that this young woman and man were totally callous and uncaring, so they must have had something to do with the murder. In reality, however, the picture is not a stand-along photograph at all. Rather, it is a single frame from a video, and its selection tells us a whole lot more about those who chose to publish it than it does about the two seeming lovebirds. Now let us consider two more image captures from the same video. The first is a lead-up to the supposed smooch. But what we see is the look of utter desolation on Amanda’s face and the look of concern on Raffaele’s. So in this context, the kiss becomes not romantic, but completely a comforting gesture. Then, when we look at this next image, we see nothing but sadness from both of them. Amanda is wiping away tears, and Raffaele has a lost, almost blank look. Had these two images been the ones the police and the media chose to highlight, we wonder whether the entire initial impression of Amanda and Raffaele would have been completely different. When it comes to criminal investigation, one thing we’ve always preached is: Before you come to a conclusion, make sure you have the total picture. for a character & behavior assassination against Amanda & Raffaele. Who knew a photo could be so powerful? This combined with the intentional lies fed to media fueled a hate campaign that had an enormous impact on this case. Excellent point. It is amazing that despite evidence that clears both of them of wrong doing they are still being charged by the Italian court system. Excellent example. During the first trial Amanda would smile at her loved ones and her lawyers when she entered the courtroom after arriving from the bleakness of prison. It didn’t matter how serious she was for hours during the court session. The pictures that were splattered across the media were of the opening smile. You can imagine the tabloid captions. Of course she still had to worry about reporters focusing on her hair. No one in their right mind would have returned for the 3rd witch trial. Ditto. And the return of Raffaele for the 3rd trial is inexplicable.